As a former NCAA Division 1A college athlete in both football and track, Dr. Camille J. George knows first-hand how important maintaining an active lifestyle is for his patients. Specializing in sports medicine and general orthopedics, Dr. George utilizes state-of-the-art arthroscopic, microscopic, and minimally invasive open procedures to prevent scarring and to maximize recovery time, allowing his patients to return to their usual activities within the shortest and safest length of time possible. 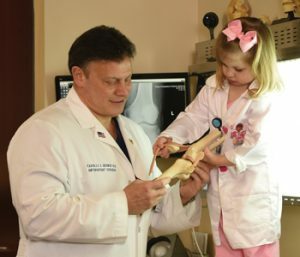 Dr. George provides operative and non-operative treatments for both general orthopedic and sports medicine conditions to all age groups as well as in office physical therapy. He is a board certified orthopedic surgeon and a member of the American Academy of Orthopaedic Surgeons. Having treated athletes of all ages from little league to professional sports for nearly 20 years, Dr. George has garnered a wealth of experience in the field of sports medicine. He has worked with the medical team of physicians for the Houston Energy, Houston Cyclones, Houston Rockets and the former Houston Oilers. Conveniently located near The Galleria, Dr. George and his highly competent and considerate staff are within reach from every part of the city. In addition to providing patients with individualized attention and personalized care, Dr. George’s office staff is bilingual in Spanish and is always ready to assist patients with all of their orthopedic needs.